How can we predefine this globally? If a domain fulfills (7) (8) (9) (10), it is called “Domain Space” or abbreviated “DS.” Every element of the DS is called “Domain Vector” or abbreviated “DV.” Due to (9), it is predefined online and therefore globally defined. 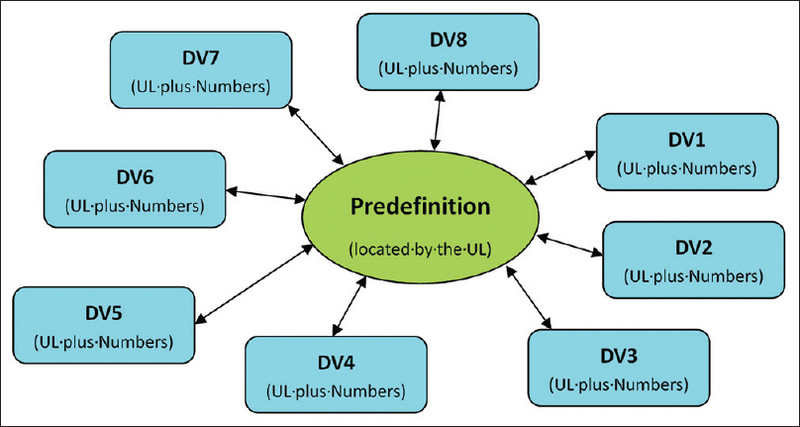 The DV contains a pointer to the online predefinition called “Uniform Locator” (abbreviated “UL”) [Figure 1] and a sequence of numbers which represents a selection (5) from the domain. An example of such a selection is illustrated as DV in [Figure 2]. The structure of the DV is minimized to maximize efficiency and to avoid unnecessary combinatorial freedom in the transported data. The UL is a pointer to the predefinition of the subsequent sequence of numbers (11) in this DV. It can be, for example, a uniform resource locator (URL) or a hierarchical number sequence or a more abbreviated pointer, for example, a byte with meaning “same UL as before” or “same concatenation of ULs as before” or a short local pointer to a local table with global internet pointers, i.e., at last to any addressable location on the Internet. Important is efficiency to achieve the function: The UL provides a globally unambiguous and efficient pointer to the unique online predefinition and simultaneously an identifier of the domain of subsequent data (numbers). Belated combination of DVs: Combinations of DVs is always possible like combinations of words in text. The advantage is more flexibility, and the disadvantage is less unambiguity: It is possible that different combinations lead to the same meaning. However, DVs can be predefined in a more complex manner than simple words, so that smaller and less ambiguous combinations of these “large building blocks” lead to enough meaning. (12)	Dimensions about preconditions of the decision. Interesting are all parameters with relevant influence on the decision and its result. (13)	Dimensions about the decision. Interesting are all relevant parameters which describe the decision. (14)	Dimensions about the decision result. Interesting are all parameters which describe relevant consequences of the decision. The medical application is explained with patient examples more detailed in the article by Orthuber. Here, we describe the most important technical and organizational details. We start with the present situation: There is a remarkable progress in the application of digital techniques in medicine, but there are still relevant interoperability problems which hinder data exchange not only worldwide, but also locally between multidisciplinary teams which want to work together for integrated and patient-centric care. Hence, for interoperable transport of medical information, standards are in development. Currently, HL7 FHIR is recommended. [Table 1] contains an example of this standard. The data (two numbers which represent date and heart rate) are mixed with longer definitions. Due to the transport of variable definitions together with data, basal preconditions (9) for globally defined information are not fulfilled. In contrast to this, the DV (11) is uniformly defined and much shorter because it contains only the UL of the global predefinition plus the data (two numbers in this case). The UL allows that all users, also all professional medical organizations and patient organizations, can create global predefinitions of medical information. A predefinition could also contain abbreviated parts of definitions as shown in [Table 1] (so parts of the HL7 FHIR standard can be reused), but it is globally unique and not transported (in varying form) together with data. The medical data are DVs [Figure 3] which can transport information about medical findings, treatment, and treatment results, so describe preconditions (12), decision (13), and result (14) in globally comparable form. Certain DVs represent a selection as shown in simplified way in case of two dimensions in [Figure 2], which also illustrates “similar” findings. Hence, “similar” medical situations become searchable and comparable because numbers are searchable and comparable. It is relevant for medicine that the predefinitions of the DVs resp. data (11) are inherently international: This makes medical experiences internationally comparable. Existing nomenclatures such as LOINC are convertible into predefinitions of DVs. According to (10), their usage should be free. 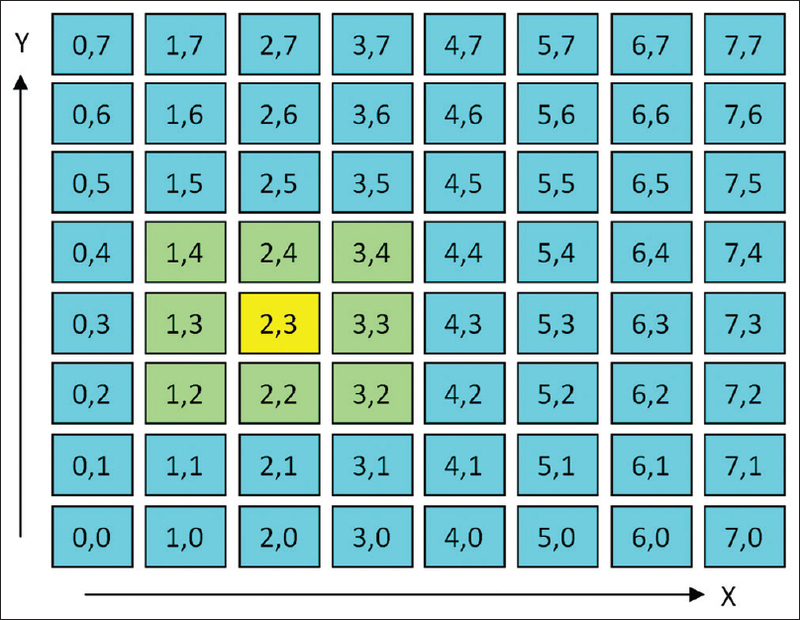 The physician provides an initial diagnosis (e.g., from International Classification of Diseases-10) to the decision support system, which answers by showing the most frequent (dimensions of DVs which represent) further diagnostics resp. measurements (inclusive data about treatment) made by colleagues under this condition. The physician decides about further diagnostics. Due to the usage of ULs, these have unique names. Because the system is connected, after completion of further diagnostics and measurements, all results are available automatically. The physician decides about the most interesting results xk. The system shows to every xk the standard deviation sk and suggests intervals Ik= [xk− rksk, xk+ rksk] for search. At this, the physician can modify the rk and also shift some Ik, for example, for testing variable treatments. After this, the intervals Ik together describe a search command which is sent to the system. The system searches the Group G with all patients whose xk lie within the Ik and makes further statistics within this group. The system shows among others to chosen parameters xl the means ml and standard deviations dl. These can be also descriptions of treatment results. Hence, by modifying the Ik in (c), the effect of different treatments on the treatment result can be checked within the individual group G “near” to the individual patient. Using the provided information and optionally further results, it is possible to continue at (b) or even at (a), to find the treatment with the best results. The most significant disadvantage is initially relevant: Up to now, there are not enough data in DV form (11). Investment in software, predefinitions, and interesting data (DVs) is necessary, so that search of DVs becomes attractive, and self-initiated users start to provide more and more DVs. Compared to the until now usual structure of digital information (sequence of numbers), the main objectifiable disadvantage of the DV (11) is the additional space requirement by (additional bits resp. numbers of) the UL. However, without UL, longer predefinition via context is necessary [Table 1]. Moreover, according to its definition, the UL can be optimized, so that it needs only minimal count of bits, compared to a URL. The new term “UL” has been introduced to signal this. The DV (11) is dependent on online predefinitions. Therefore, download of used parts of online predefinitions is necessary. After this, the DV can be used also offline. There should be an infrastructure which guarantees stability of online predefinitions, for example, by backup and mirroring. The DV data structure (11) enables the combination of maximal competence (of all users which can predefine digital information via UL) with maximal efficiency (number sequence allows predefinition of every bit). Redundant varying (with data mixed) definitions (also unnecessary syntax overhead) are avoided. Every DV predefinition is also a DS predefinition and hence efficiently predefines online all DVs with the same UL [Figure 1]. This enables similarity comparison later. Existing predefinitions can be reused freely (10) within new predefinitions (nesting of DV predefinitions), so that complex search over multiple DSs becomes possible. If, for example, there is a one-dimensional DV predefinition with dimension “length in meter” and another DV predefinition with dimension “width in meter,” these can be included in new more complex predefinitions. Then, it is possible to search within all new predefined DSs for all DVs with certain length and width. The predefinition of a DV is adaptable to the needs – from simple to complex. Additional dimensions can be appended afterward. Efficient predefinition is possible. If the value set of a DV dimension is known a priori, we need, for example, not more than 1 bit for selection in case of 2 alternatives (yes/no). In case of [Figure 2], due to 64 = 26 possibilities, we need 6 bits and so less than 1 byte for selection. If (the range of) the value set of a dimension is not known a priori, the first byte of a number (mantissa and exponent if necessary) can also contain bits with length information. Such a number can adapt its length to the requirements [self-extending number, [Figure 4], to minimize the count of unused bits. Generation of DV predefinitions and of DVs can be automated, for example, by integration into programming languages. The identification of DV data by UL makes these interoperable, globally searchable, and comparable. This is generally important in informatics and for all objectifiable information exchange. For general science, (15) comes to the point. 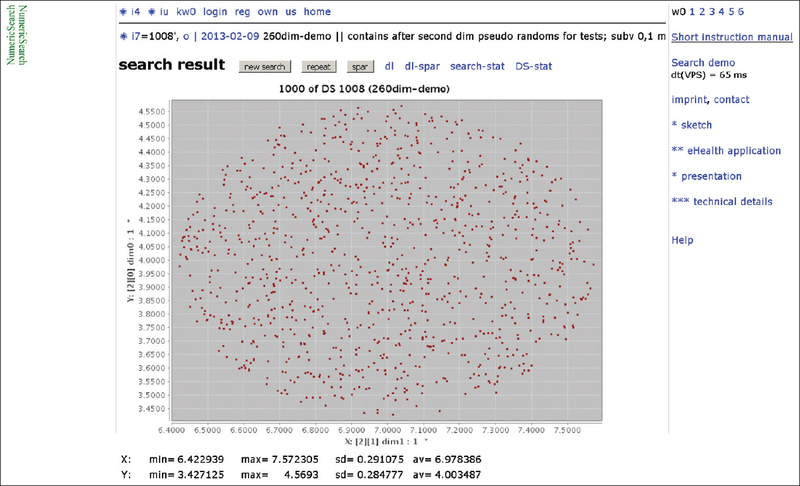 Further features of DVs are described in studies by Orthuber., There is also the search engine http://numericsearch.com, which introduces the principle and demonstrates user defined similarity search in a local database [Figure 5], [Figure 6], [Figure 7]. Orthuber W, Dietze S. Towards Standardized Vectorial Resource Descriptors on the Web. Vol. 2. In GI Jahrestagung; 2010. p. 453-8. Available from: http://www.cs.emis.de/LNI/Proceedings/Proceedings176/453.pdf. [Last accessed on 2018 Oct 02]. Orthuber W. Uniform Definition of Comparable and Searchable Information on the Web. Arxiv Preprint arXiv: 1406.1065; 2014. Available from: https://www.arxiv.org/abs/1406.1065. [Last accessed on 2018 Oct 02]. 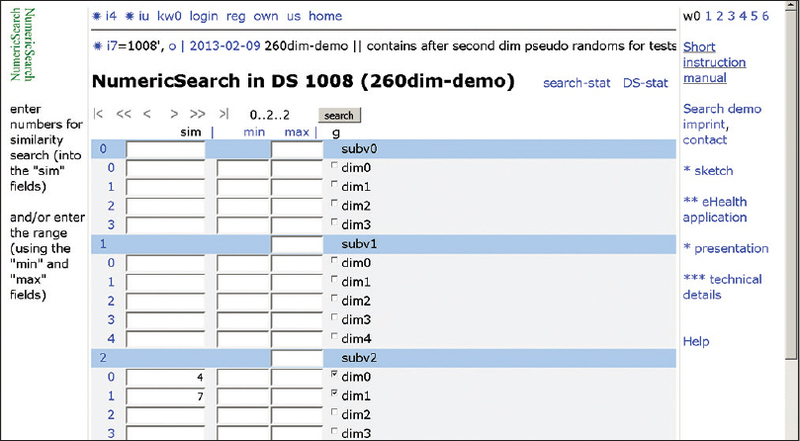 Orthuber W. Demonstration of Numeric Search in User Defined Data. 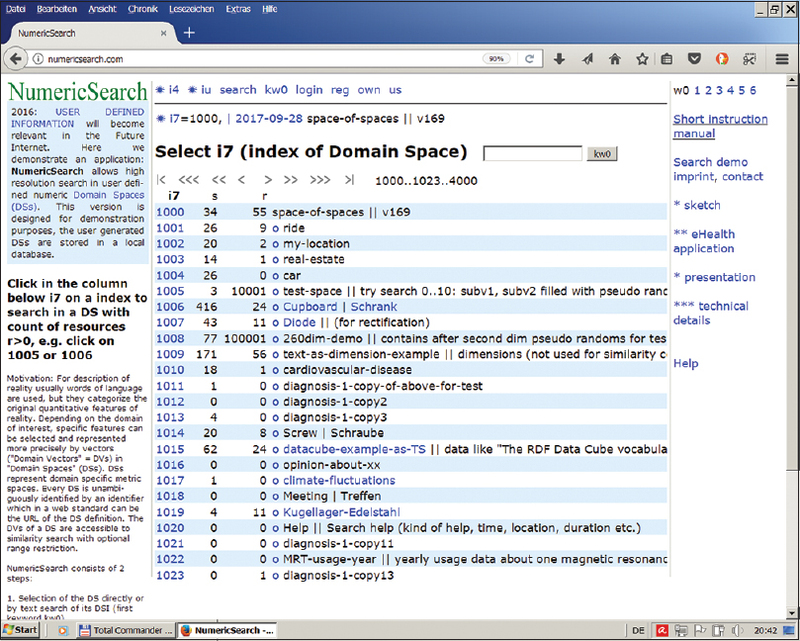 Numeric Search Viewed; May 2018. Available from: http://www.numericsearch.com. [Last accessed on 2018 Oct 02]. Orthuber W, Hasselbring W. Proposal for a New Basic Information Carrier on the Internet: URL Plus Number Sequence 2016. Proceedings of the 15th International Conference WWW/Internet. p. 279-84. Available from: http://www.oceanrep.geomar.de/34556. [Last accessed on 2018 Oct 02]. Orthuber W. Why Informatics and General Science Need a Conjoint Basic Definition of Information. Arxiv Preprint arXiv: 1801.03106; 2018. Available from: https://www.arxiv.org/abs/1801.03106. [Last accessed on 2018 Oct 02]. Shannon CE. Mathematical theory of communication. Bell Syst Techn J 1948;27:379-423. Available from: http://www.math.harvard.edu/~ctm/home/text/others/shannon/entropy/entropy.pdf. [Last accessed on 2018 Oct 02]. Zezula P, Amato G, Dohnal V, Batko M. Similarity Search: The Metric Space Approach. Vol. 32. New York, USA: Springer Science & Business Media, Inc.; 2006. Orthuber W. Online definition of comparable and searchable medical information. Digit Med 2018;4:77. Available from: http://www.digitmedicine.com/article.asp?issn=2226-8561;year=2018;volume=4;issue=2;spage=77;epage=83;aulast=Orthuber. [Last accessed on 2018 Oct 02]. Bender D, Sartipi K. HL7 FHIR: An Agile and RESTful Approach to Healthcare Information Exchange. Computer-Based Medical Systems (CBMS), IEEE 26th International Symposium on. IEEE; 2013. p. 326-31. HL7. 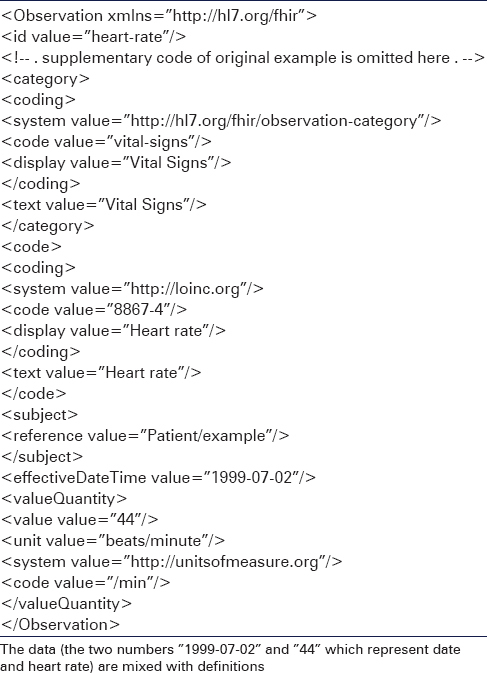 FHIR Resource Observation – Examples. FHIR Release 3 (STU; v3.0.1-11917) Generated on Wed; 19 April, 2017. Available from: http://www.hl7.org/fhir/observation-examples.html. [Last accessed on 2018 Nov 12]. McDonald CJ, Huff SM, Suico JG, Hill G, Leavelle D, Aller R, et al. LOINC, a universal standard for identifying laboratory observations: A 5-year update. Clin Chem 2003;49:624-33. World Health Organization. ICD-10: International Statistical Classification of Diseases and Related Health Problems: Tenth Revision; 2016. Available from: http://www.apps.who.int/classifications/icd10/browse/2016/en. [Last accessed on 2018 Oct 02]. Paterson BL, Thorne SE, Canam C, Jillings C. Meta-Study of Qualitative Health Research: A Practical Guide to Meta-Analysis and Meta-Synthesis. Vol. 3. Thousand Oaks, London, New Delhi: Sage Publications; 2001.